Père-Lachaise Cemetery, Paris's largest burial ground (44 hectares, or over 100 acres), located 2 km (1.2 miles) southeast of Place de la République (map), is a peaceful, hilly, forested reserve for the graves of Parisians famous, infamous, native, foreign, common and even some unknowns. It's enjoyable to take the Métro to Père-Lachaise and spend a few hours wandering its wooded lanes in search of history. With over one million burials and two million visitors each year, Père-Lachaise (the East Cemetery), is a busy place. Wear comfortable shoes and be prepared to walk! The number of famous people buried at Père-Lachaise is amazing. During your visit you may come across composers Chopin and Berlioz, artists Seurat, Laurencin, and Ingres, singers Yves Montand, Édith Piaf, and Jim Morrison, as well as politicians, writers, and architects—and even the man credited with introducing the guillotine to France! Père-Lachaise is more than a cemetery: it's also a beautifully landscaped park and a monumental sculpture garden. We love going back and visiting familiar parts and exploring new avenues. There's always something interesting to see and explore. Designed by Brongniart and opened in 1804, the cemetery is laid out on land once owned by the Jesuits and favored by Louis XIV's confessor, Père-Lachaise. It has been described as the home of "permanent Parisians." Here are some tips on visiting this wonderful spot, and here are some of the famous people buried at Père-Lachaise. 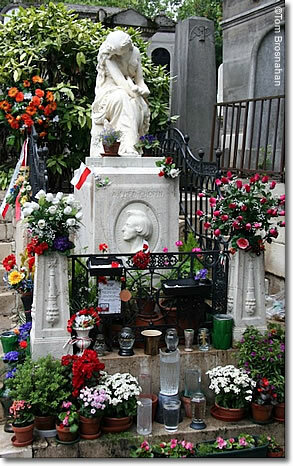 The grave of Frédéric Chopin (1810-1849) in Père-Lachaise Cemetery, Paris, France—always decorated with fresh flowers, even a century and a half after his death.